Fun Fact: Drawing and inking this comic was an excruciating experience because I smashed my thumb beforehand. That’s why it looks so rough. It’s been a while since we’ve seen Emery’s mom. He always seems to be putting her through some kind of trauma. I like to imagine that even a multi-billionaire’s mom could still tell them what to do, assuming there’s no love lost. I thought the idea of even a mom just throwing money around was funny, especially for so common place an interaction as the one taking place here. Plus, it’s fun to remind everybody once in a while that Emery has loads of cash he’s not really using even though he could. He just seems to want to keep being a normal guy. They say money corrupts, but I guess he’s pretty humble. Here’s an awesome color comic strip that I did for The Daily Texan’s color page, so you guys get it in all its CMYK glory. I’ve never been one to care much whether people acknowledge my comic strip. In fact, up until a few weeks ago I lived fairly comfortably under the impression that very few people probably read it. I never got all bent out of shape when no one seemed to know it was me that created tWC, or when those who did comment on it thought it was bad. That’s just how these things go. Over the past few weeks though, I seem to be having more and more people recognizing me as “That guy who draws that comic.” It’s something I never expected to happen, and it surprises me every time. So I humbly manage an “Oh yeah that’s me.” and maybe a “Thanks.” if they inform me that they like it, before getting sort of awkwardly quiet and not knowing whether I should walk away or say more or wait for them to say more or wait for them to walk away. Most of the time I just choose to smile, nod, and depart. But inside it warms me just a little to know that hey, that’s one more person who thinks I should keep doing what I do. So I do it for you, readers. Thanks for caring. 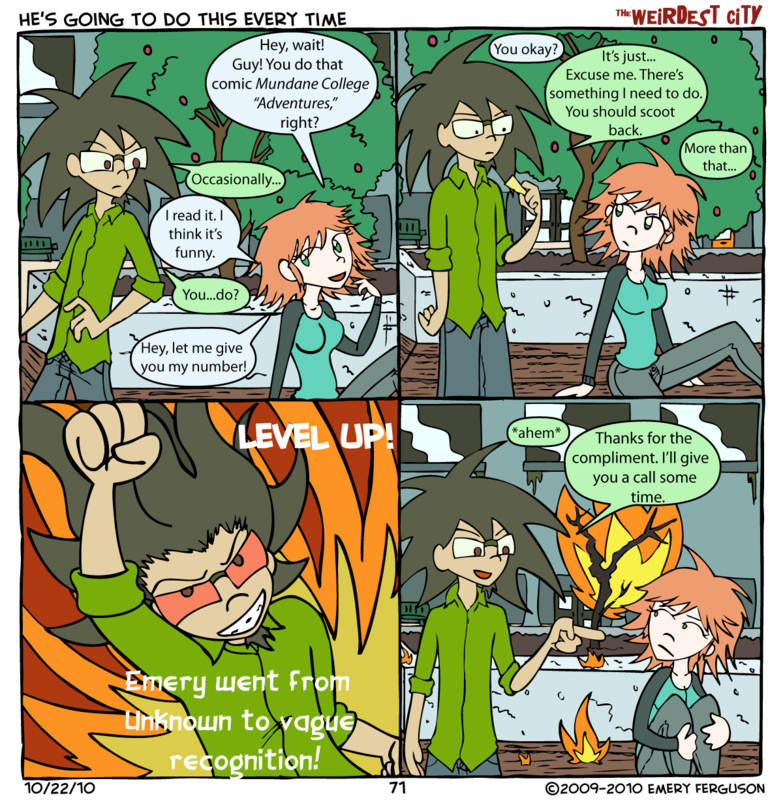 As for the comic itself, it’s an idea that came from two things: First, I was considering how leveling up would work in real life. For most people, who really don’t have monsters or villains to defeat, the greatest battles come from personal issues. To the outsider it may not seem like much of a struggle, but a first date or passing a test or something is a pretty big deal for some people (at the time), so I imagined a world where people strike a cheesy pose and have some sort of terrible background music play after seemingly trivial milestones. 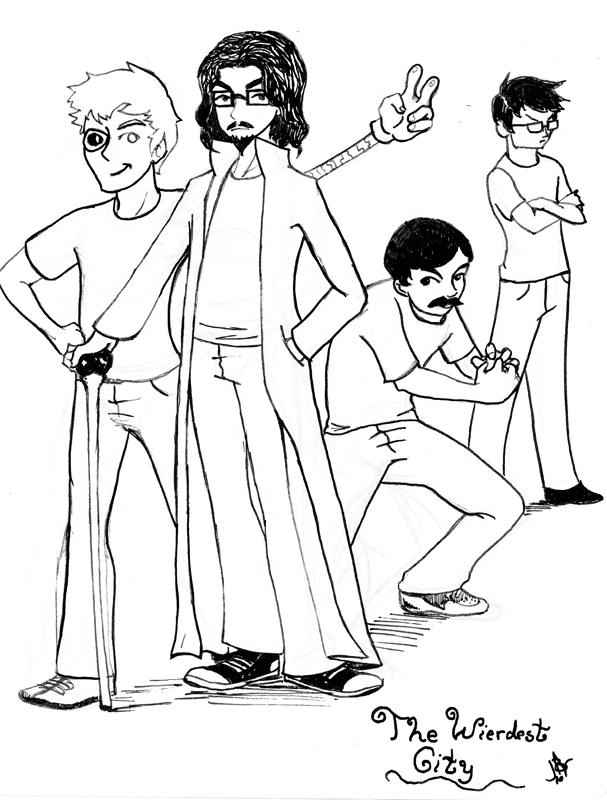 Also, there was this ad the DT Comics page ran during tryouts about how if you were on the staff you would get ladies. SO MANY LADIES. And while I have never seen any evidence of this, I thought “What if…?” So I made it happen to this cartoon Emery, who you now know does a comic strip of his own. No, his is not the Weirdest City though. Because he is not me. His comic strip is probably about dicks or whatever else it is that DT staffers like to draw. Or maybe it’s about the little milestones in our lives that we just talked about. Who knows? Maybe we’ll get a glimpse at a strip or two of Mundane College “Adventures” some time. Don’t you hate getting that scratchy feeling in the back of your throat when you are in a business meeting/class/movie/wherever. The room is totally silent and something important is being said, and you know what’s coming. It’s only a matter of time before an onslaught of coughing cuts from your face through the room and annoys everyone. So you sit hunkered down, turning red, eyes watering, maybe an involuntary spasm or two as you try to choke back your body’s natural reaction. But if you resist you only make it worse. We’ve all been there. When you do comics on a regular basis, and you get by on six dollars a comic strip, sometimes you just have to draw something outrageously stupid. This is one of those times for me. Most of my favorite memories of doing comics are the ones where I get to draw impossibly wild faces and expressions. Also, I don’t normally mention when I think something is wrong with the comic in hopes that nobody will notice if I don’t say anything, but I have to apologize for the roughness of this comic. It was rushed, but also my usual pens just totally ran out of ink despite being relatively new still. Annoyed at how frequently my Microns fail me, I switched to a different brand of inking pens that I used for the first time on this comic. Not that I’m a masterful inker or anything, but these new pens and I are still in the “getting to know you” phase of our relationship so the next few might look like I inked them while fighting the shakes from a 50-hour caffeine bender. I’m sure that guy is okay. Looks like Jonatron is a little sensitive about his work, or lack thereof. I originally thought this one up a while back because people would often ask me “Dude, what’s with the robot eye?” And the answer is that I originally planned for Jonathan to be a sort of crazy inventor before I joined the DT page. Unfortunately, it’s hard to tell a coherent story in a newspaper because it’s such an episodic medium, so it didn’t really work out that way. As a result, the character ended up with this mechanical eye that was canon, and not much else. Of late, I have found a way to get back to the earlier idea of what Jonatron was going to be, and will be deepening his character a little. For example, now you know he has a more sinister side, and he’s willing to blow a guy away for saying the wrong thing. I’m sure he has a spare eye somewhere. In case you’re wondering “much imagination” were the next two words that were going to come out of Solomon’s mouth. Is it true? You be the judge. Katamari Damacy. I feel like I was inevitably going to do this joke sooner or later. It was almost an obligation. If you’ve played the game, you know that it’s addictive fun once it lures you in. For everything else involved that isn’t the player though, it is a tale of terror, theft, and immense property damage. Imagine you are a cow or something minding your own business one day when who should roll through but the prince up there, and then you never see your cow-friend again.Tragic. And if you haven’t heard the theme, go look it up. Go ahead. I’ll wait.